The above info came from R.G., and was edited by yours truly (contact me). The image came from Paradigm City. Once there was a reporter (presumably German) for the Paradigm Press named Michael Seebach. He sought to uncover the truth about what caused people to lose their memories forty years ago. What he uncovered unhinged him. To top it off, he was caught in a fire (likely caused by his former employers, in an attempt to silence Seebach), which forced him to wrap his head and hands in bandages. 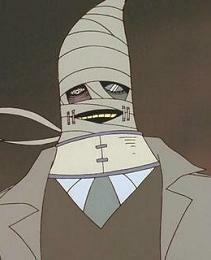 Renaming himself Schwarzwald ("Black Forest"), he has sought to make the people of Paradigm see the truth as he sees it. In particular, he targets those he sees as corrupt as the city which he has come to despise. 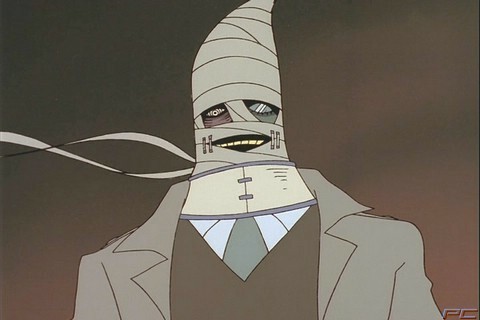 The only one who stands against him is Roger Smith, the Negotiator, or whom he calls "Paradigm's Dog". Eventually, Schwarzwald finds his own Megadeus to counter Roger's Big O... a flying Megadeus he calls Big Duo. Eventually, Schwarzwald uncovered the Big-type Megadeus Big Duo to counter Big-O. However, it was heavily damaged by Big-O and Schwarzwald retreated to the desert, where he was killed by the just reawakened Leviathan Megadeus. Despite his "death", Schwarzwald's soul lived on in the rebuilt Big Duo Inferno, which after disposing of it's "unworthy pilot" Alan Gabriel, took the MegaDuece to the air, learning the truth of Paradigm, which unhinged Schwarzwald yet again during his last moments in the continuity. The above description came from R.G. and fractyl2, and was edited by yours truly (contact me).